At KINGS Security Doors, our experienced team are committed to delivering the highest level of service excellence to you. Whether you need security screen doors for your business or at home, our experts will deliver to you, all throughout Sydney. We will assist you throughout every stage of the process, from initial measurements and quotes, all the way through to installation and aftercare. Our proven six-stage process will leave nothing to chance and give you the best security available. We ensure that your security door is a perfect fit with a comprehensive free measure and quote. As well as providing you with an accurate quote, this process will help us understand your needs and recommend the best door and window security screens for your needs. Once you have accepted our quote we will process your payment as soon as possible. This means we can get started on your products faster. Whichever door you’re after, our Australian team will get the job done. We utilise the strongest and best materials for your security door, including aluminium and steel. 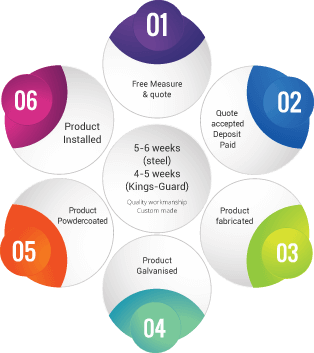 To guard your security screen doors from damage and environmental effects, KINGS use a combination of galvanised steel and Zinc based primers. This gives a much greater adhesion to the powder coat for a longer lasting product. While regular paint contains harmful elements that can cause metal materials to deteriorate, powder coating sprays the vibrant colour of your choice onto your security door. Powder coating is designed to stay in place and not fade over time. After it has been through the manufacturing process, a member of our skilled team will expertly install your security screen doors at your home or business. Depending on the style of door you are having installed, the entire process may take between 4-6 weeks to be completed. At KINGS Security Doors we are here to assist you with your home security requirements. To arrange for a free and detailed quote from our team, feel free to contact us today.